Okay, we totally look like we're adventuring through Morocco for an epic elopement right? Nope! These two cuties modeled for me (Carly in the freaking gorgeous A&Be Bridal dresses) in the incredible Glamis Sand Dunes in California. When Carly and Germain reached out for me to shoot their wedding back in Wisconsin and I found out they were from San Diego, I KNEW they had to model for me for this project- I mean this is pretty much the coolest bridal shoot ever. Carly was still looking for her own wedding dress when we came out, so our shoot kind of turned into the weirdest episode of Say Yes to the Dress with her slipping into these incredible gowns in the dunes- and Germain LOVED them. Seriously, his reaction was freaking adorable. We were barely in the dunes for an hour, but these two killed every minute. 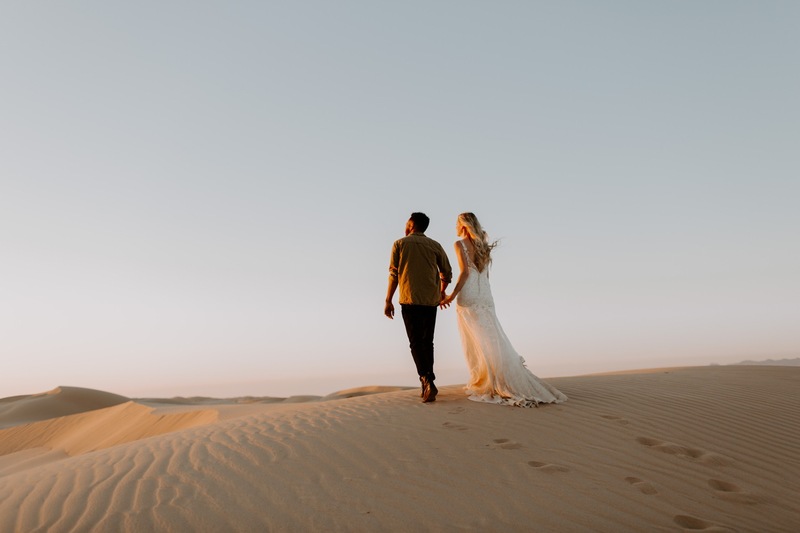 I couldn't be happier with what we created, seriously it looks like these two ventured out into the Sahara Desert to visit the rolling dunes- instead of just a few hours from their home! I can't wait to see these two again and give them the biggest hug when we meet again for their wedding this July- and you better believe I'll be showing them off again then!